The Aztec calendar is the calendar system that was used by the Aztecs as well as other Pre-Columbian peoples of central Mexico. 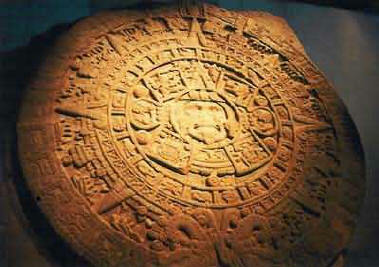 It is one of the Mesoamerican calendars, sharing the basic structure of calendars from throughout ancient Mesoamerica. The calendar consisted of a 365-day calendar cycle called xiuhpohualli (year count) and a 260-day ritual cycle called tonalpohualli (day count). These two cycles together formed a 52-year "century," sometimes called the "calendar round." The xiuhpohualli is considered to be the agricultural calendar, since it is based on the sun, and the tonalpohualli is considered to be the sacred calendar. You can use this image as your FREE Desktop Wallpaper: First, follow the "wallpaper" link, next, right-click on the image and select "Set as Background". You can also download the image: right click on the image, save it to your hard drive, and then select it as your wallpaper. The graphic image below shows the Aztec Calendar, on display at the Museo Nacional de Antropologia in Mexico City, Mexico. The original object is a 12 feet, massive stone slab, carved in the middle of the 15th century. Many renditions of it exist and have existed through the years and throughout Mexico. A particular tzolkin/haab date recurs every 18,980 days, whereas a long count date (assuming that the long count starts over at 0.0.0.0.0 on reaching 13.0.0.0.0) recurs every 1,872,000 days (once in 5,125.37 years). The combination of a long count date and a tzolkin/haab date occurs only once every 136,656,000 days (approximately 374,152 years or 73 Maya eras). The Classic Mayan civilization was unique and left us a way to incorporate higher dimensional knowledge of time and creation. By tracking the movements of the Moon, Venus, and other heavenly bodies, the Mayans realized that there were cycles in the Cosmos. From this came their reckoning of time, and a calendar that accurately measures the solar year to within minutes. For the Maya there was a time for everything and everything had it's place in time. The priests could interpret the heavens and calendar. As the result they could control the daily activities of the populace. Knowing when to plant, when to harvest, the rainy and dry seasons, etc. gave them total power and control. Their comprehension of time, seasons, and cycles was immense. The Maya understood 17 different Calendars based on the Cosmos. Some of these calendars go back as far as ten million years and are so difficult that you would need an astronomer, astrologer, geologist, and a mathematician just to work out the calculations. They also made tables predicting eclipses and the orbit of the planet Venus. The calendars that are most important to beings of earth are the Haab, the Tun-Uc and the Tzolk'in. The Tzolk'in is the most important and the one with the most influence. The Haab is based in the cycles of earth. It has 360 + 5 days, totalling 365 days. The Haab uses 18 months with 20 days in each month. There is a 19th month called a Vayeb and uses the 5 extra days. Each month has it's own name/glyph. Each day uses a sacred sun/glyph. The Tun-Uc is the moon calendar. It uses 28 day cycles that mirrors the women's moon cycle. This cycle of the moon is broken down into 4 smaller cycles, of 7 day each. These smaller cycles are the four phases of moon cycle. Archaeologists claim that the Maya began counting time as of year 3114 B.C. This is called the zero year and is likened to January 1, 1 AD. All dates in the Long Count begin there, so the date of the beginning of this time cycle is written 0-0-0-0-0. 13 cycles of 394 years will have passed before the next cycle begins, which is in year 2012 A.D. (13-0-0-0-0). 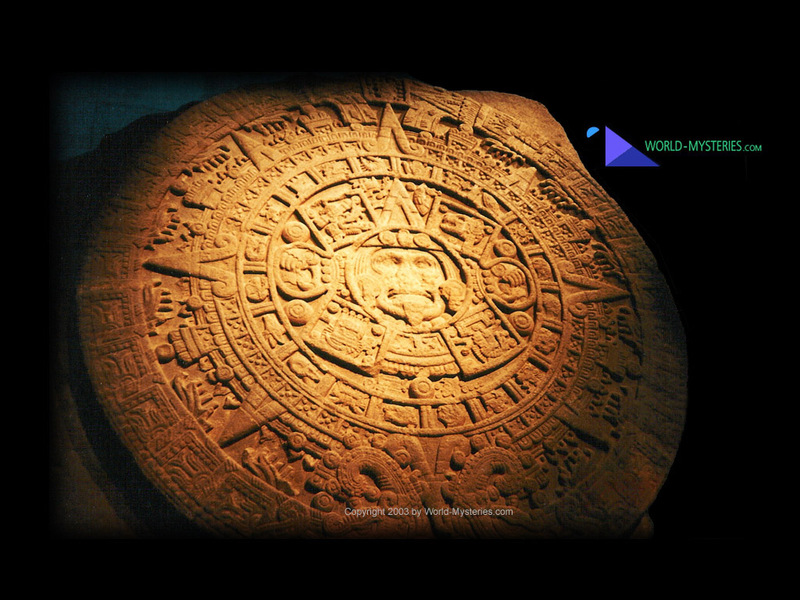 The Mayas used three different calendar systems (and some variations within the systems). The three systems are known as the tzolkin (the sacred calendar), the haab (the civil calendar) and the long count system. The tzolkin is a cycle of 260 days and the haab is a cycle of 365 days. The tzolkin cycle and the haab cycle were combined to produce a cycle of 18,980 days, known as the calendar round. 18,980 days is a little less than 52 solar years. The "Calendar Round" is like two gears that inter-mesh, one smaller than the other. One of the 'gears' is called the tzolkin, or Sacred Round. The other is the haab, or Calendar Round. The smaller wheels together represent the 260-day Sacred Round; the inner wheel, with the numbers one to thirteen, meshes with the glyphs for the 20 day names on the outer wheel. A section of a large wheel represents part of the 365-day year - 18 months of 20 days each (numbered 0-19). The five days remaining at year's end were considered evil. In the diagram, the day shown is read 4 Ahua 8 Cumka. As the wheels turn in the direction of the arrows, in four days it will read 8 Kan 12 Cumku. Any day calculated on these cycles would not repeat for 18,980 days - 52 years. Thus the Mayas could not simply use a tzolkin/haab date to identify a day within a period of several hundred years because there would be several days within this period with the same tzolkin/haab date. The Mayas overcame this problem by using a third dating system which enabled them to identify a day uniquely within a period of 1,872,000 days - approximately 5,125.36 solar years. To do this they used a vigesimal (i.e. based on 20) place-value number system, analogous to our decimal place-value number system. A Maya long count date is a modified vigesimal number (as described above) composed of five places, e.g. 9.11.16.0.0, and interpreted as a count of days from some base date. There are many long count dates inscribed in the stellae and written in the codices. Calculation of the decimal equivalent of a long count yields a number of days. This is regarded as a number of days counted forward from a certain day in the past. It is the number of days since the day 0.0.0.0.0. The obvious question is: What day was used as the base date? This question has two aspects: (1) What day was used by the Mayas as the base date? (2) What day was that in terms of the Western calendar? We shall return to these questions below. Thus, for example, 9.15.9.0.1 denotes a count of 9 baktuns, 15 katuns, 9 tuns, no uinals and 1 kin, or in other words, 9*144,000 + 15*7,200 + 9*360 + 0*20 + 1*1 days, or 1,407,201 days. It is a count of days from the Maya base date of 0.0.0.0.0. Most of the long count dates which occur in the stone inscriptions have a baktun count of 9. The period 9.0.0.0.0 through 10.0.0.0.0, the period of the Classic Maya, is now thought by scholars to coincide with the period (approximately) 436 A.D. through 829 A.D. There are, however, some strange anomalies. Morley deciphers two long count dates (found at Palenque) as 1.18.5.4.0 and 1.18.5.3.6 (14 days apart) which are some 2,794 solar years prior to 9.0.0.0.0. Since there is no evidence that the Mayas existed before about 500 B.C., what could these early long count dates possibly be referring to? We would expect that the next higher unit after the baktun would consist of 20 baktuns, and it appears there was such a unit, called a pictun. However, no long count date occurs with a baktun count of more than 12, except that 13.0.0.0.0 occurs. A widely-accepted school of thought holds that in the Maya long count system 13.0.0.0.0 marks the beginning of a new cycle, and so is equivalent to 0.0.0.0.0. In this view, 13 baktuns make up a great cycle or, Maya era, of 13*144,000 = 1,872,000 days (approximately 5125.37 solar years). The date 0.0.0.0.0 is equal to year 3113 B.C.. The date 13.0.0.0.0 is equal to year 2012 A.D.. There are 260 elements in this sequence. That is because 260 is the least common multiple of 13 and 20. Thus the cycle of (13) tzolkin day numbers combined with (20) tzolkin day names repeats each 260 days. 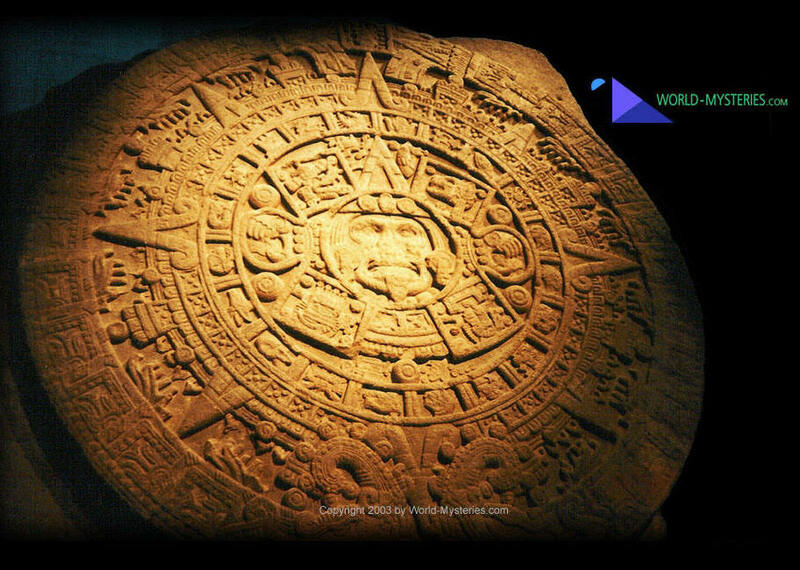 In order to explain this 260-day calendrical cycle some have speculated that the Mayas chose this number of days because their allegedly advanced astronomical knowledge revealed to them that a period of 260 days fits well with certain astronomical periods, such as the eclipse-year. A more prosaic explanation is that there were originally two branches of Maya society, one of which used a 13-day cycle of numbered days and the other a 20-day cycle of named days. (There is a set of thirteen Maya gods, which may be the origin of the 13 numbered days, similar to our week.) Then at some point in early Maya history the two groups merged, combining the two calendars so that neither group would lose their method of day-reckoning, resulting in the 260-day cycle as described above. The five extra days formed the "month" of Uayeb, meaning "nameless". The five "nameless" days were considered unlucky. One did not get married in Uayeb. The haab cycle thus consisted of 18*20 + 5 = 365 days, the integral number of days closest to the mean solar year of 365.2422 mean solar days. For most of Maya history the first day of Pop was denoted by 0 Pop and the last by 19 Pop. However, on the eve of the Spanish conquest the first day of Pop began to be numbered 1, and the last day 20 (except for Uayeb), so that the year began with 1 Pop and ended with 5 Uayeb. There is some uncertainty as to whether (what has usually been taken to be) the first day of each haab month (e.g., 0 Zip) is really the last (i.e., the 20th, or the 5th) day of the preceding month (Pop in this case), or in other words, whether the last day of each month was actually written as "the day before the beginning of (the next) month", where the glyph translated as "the seating of" was used with the meaning of "the day before the beginning of the next month, namely ...". 0 Zip can be interpreted either as the first day of Zip or as the last day of Pop, but unfortunately the classic Maya are no longer here to tell us how they understood this date. Since 260 = 4*5*13 and 365 = 5*73, the earliest that a tzolkin/haab date combination can repeat is after 4*5*13*73 = 18,980 days, or just short of 52 solar years. This cycle of 18,980 days is called the Maya calendar round. If you have a Java-enabled browser, you will see an interactive calendar converter routine below. Fill in the Gregorian Date in the top fields (day, month number, year) and press `Convert' to find the Maya calendar date corresponding to that. Please note that the order is day, month, year. Please note that this is just a picture.. you need a Java-enabled browser. Note: This Java applet uses the 584,283 correlation. If you prefer the 584,285 correlation, you have to subtract 2 days from the date you want to convert. For instance: Jan 1, 1996 would become Dec 30, 1995. The Julian calendar, introduced by Julius Caesar in 46 B.C., is the basis of our modern calendar. It consists of a system of twelve months, January, February, etc. (although New Year's Day has not always been January 1st). If the number of the year is divisible by 4 then February has 29 days, otherwise it has 28. A date in the Julian calendar is termed a Julian date. The Romans identified their years as a number of years supposed to have elapsed since the founding of Rome (which we now date as having occurred in 753 B.C.) Following the merger (under Constantine) of the Christian Church and the Roman Imperium years came to be numbered with reference to the year of the birth of Christ (now regarded as actually having occurred in 4 B.C.) In this system the year immediately before the year 1 A.D. is the year 1 B.C. According to Aveni , p.127, "the serial numbering of the years as we know them did not actually begin until the sixth century ..." Thus dates prior to 600 are always uncertain. The Emperor Augustus also tinkered with the lengths of the months during his reign, introducing a further element of uncertainty, and it is also possible that the Council of Nicea (325 A.D.) readjusted the calendar by a couple of days. (a) The day following October 4, 1582, was declared to be October 15, 1582, thereby excising ten days from the calendar. (b) A year was declared to be a leap year if (i) it was divisible by 4 but not by 100 or (ii) it was divisible by 400. (c) New rules for determining the date of Easter were introduced. The Gregorian Calendar is now commonly used throughout the West and is the de facto international common calendar. There have been numerous suggestions for replacing it with a more "rational" calendar, but old habits die hard and any change would be expensive. Astronomers use a system of dating days known as the Julian day number system, in which a day is identified as that day which is a certain number of days before or after the day -4712-01-01 (January 1st, 4713 B.C.) in the Julian calendar. Thus, for example, the day whose Julian day number is 584,283 is September 6, -3113 in the Julian calendar, 584,283 days after January 1st, -4712 J. This day is also August 11th, -3113 in the Gregorian calendar. By 2001-01-01 G we will have reached the day whose Julian day number is 2,451,991, by which time nearly two-and-a-half million days will have elapsed since -4712-01-01 J.
Sequences and cycles are readily described as spirals in the Dreamspell and sacred geometries. The numbers of the Pythagorean Lambdoma are 1, 1, 1, 1 an 1, 2, 3, 4. This is an obvious sequencing that can be understood in cycles. The Fibonacci spiral is fundamental to all life forms. The Fibonacci is a simple matrix that starts with 1 then adds 1 to get a sum of 2 the adds the previous number back into itself to get a sum of 3 (I +2=3) then repeats that sequence to get a sum of 5 (3+2=5). Primary numbers of the Fibonacci on the number 1 carried to 13 places are: 1, 1, 2, 3, 5 8, 13, 21, 34, 55, 89, 144, 233. Solar systems are designed by nature in Fibonacci spirals as are human hands, sunflowers, and shells. This sequencing is a fundamental design tool of Creation. Spectacular patterns are found by applying the Fibonacci spiral to key numbers of the Mayan calendar: 20, 13 and 18. The sacred calendar (Tzolkin) uses 20 and 13 The civil calendar (Haab) uses 20 and 18. The common denominator of both is 20. If you apply the Fibonacci sequence to the number 20 and carry the sequence out to 26 places, then multiply each number of the sequence by 13, then divided it by 18 you will discover that the results of these factors shifts and starts new internal sequencing at the 13th place in each sequence. The 12th place comples a sequence and the 13th starts a new sequence internally. periodically visited this solar system. The evidence of archaeological ruins are mute testimony to the presence of intelligent builders in now ancient history. The evidence is clear. Someone with advanced knowledge of astronomy has visited peoples of this planet and left calendars as a signature note. This is discovered in correspondences of world calendars: Mayan, Tibetan, African, Vedic, and Hebraic. Similar calendar schemes are found in each of these cultures. The European calendar mandated by Pope Gregory in 1583 is the only world calendar that did not intercalate at least two celestial cycles. The Hebraic calendar acquired by Enoch after he was translated in a beam of light intercalated solar and lunar cycles in a fashion similar to the Maya. The Dogon in Africa were given four calendars by visitors from Sirius B: Solar, lunar, Venusian, and civil. The Tibetan calendar is so similar to the Mayan that traditional scholars now speculate that they share a common origin. The Vedic calendar is based on cosmic cycles, or Yugas. An ancient Hindu astrology used 27 houses of 13 degrees 20 minutes, which are key numbers in the Mayan calendar. This study is an account of what is known of Babylonian astrology, retelling a lot of Mesopotamian material that has been buried in abstruse academic tones. Although it is most specifically about Mesopotamian astrology, it also tells the story of the discovery in the 19th century of this ancient city, and describes what is known of their culture. The second part of the book focuses on each of the seven major deities of their religion - their myths, cults and omenology, and how much of these ancient Babylonian interpretations of the gods natures has survived in modern astrology.